The North Carolina State Legislature passed Session Law 2013-15 to expand the Newborn Screening program established by the Department of Health and Human Services to include newborn screening for critical congenital heart defects (CCHD) utilizing pulse oximetry. As a result, of this legislation, public health rules requiring CCHD screening of every neonate and required reporting of data related to CCHD screening went into effect on July 25, 2014. In addition, reporting requirements about CCHD screening are now in effect in order to allow for mandated data collection for public health surveillance of CCHD through the NC Birth Defects Monitoring Program. 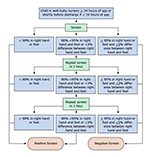 All medical facilities and health care providers who perform CCHD screenings on neonates and infants will be required to electronically report specific data elements about those neonates and infants with positive or failed screenings. These medical facilities and health care providers will also be required to report aggregate data elements related to CCHD screening of neonates and infants.